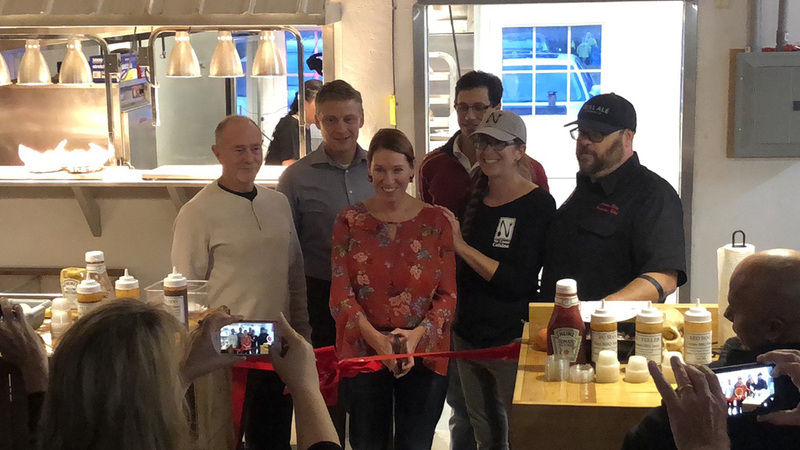 After enjoying much success in their pop-up restaurant, Scarlet Lane Brewing Company, Andrew and Whitney Klein recently opened Trax BBQ, a Carolina-style barbeque restaurant at 7724 Depot St., McCordsville. Prior to the pop-up restaurant, Andrew worked as a chef and prepared food for friends, family and social events. He launched a catering company, No Coast Cuisine, last year. After encouragement from friends, the Kleins traveled to the Carolinas to explore the barbeque scene. Town Manager Tonya Galbraith suggested the couple look into Scarlet Lane Brewing Company. The Kleins have operated a pop-up restaurant out of the space for the past year. The restaurant created a following, and the customer response encouraged the Kleins to move into their own building. “It’s casual service, counter service, so you come to the counter and order,” she said. Menu items include pulled pork, ribs and brisket and sides like macaroni and cheese and coleslaw. Trax BBQ is open from noon to 8 p.m. Sunday, 11 a.m. to 8 p.m. Wednesday and Thursday and 11 a.m. to 10 p.m. Friday and Saturday. It is closed Monday and Tuesday.